Wang Guangyi was born on 1957 Born in Harbin, China. He lives and works in Beijing, China. The paintings of Wang Guangyi belong to the category of Chinese contemporary art termed Political Pop: work that appropriates the visual tropes of the propaganda of the Cultural Revolution, reworking them in the flat, colorful style of American Pop. To understand the works of artists engaged in this practice, it is important to recognize the significance and specificity of the images they are using to fashion their work. 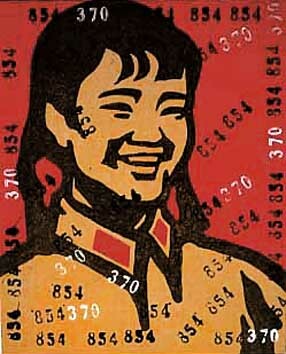 Without this knowledge, the work of artists like Wang Guangyi may be reduced to a mere aestheticization of the experiences of the Cultural Revolution, a view which threatens to limit the discussion of these works to their formal elements, foreclosing more important ideological and historical questions that must be raised. It is perhaps equally essential, particularly for Western audiences, to keep in mind the dominance that the Maoist regime held over visual culture and artistic production in China from 1949 to 1976, a control that reached a near totality between 1966 and 1972, during the Gang of Four's reign [i]. Certainly, the vast legacy of propaganda that resulted from this period will continue to impact artists interested in critically examining China's recent visual history. After all, these images were more than simply popular; for a time, they were the only ones allowed. 2006 * Galerie ARARIO, Seoul, Korea. 2004 * Galerie Urs Meile, Lucerne, Switzerland. 1997 * Littmann Kulturprojekte, Basel, Switzerland. Conclusions: Wang Guangyi had already established his own style and the impact of the work had won him a strong reputation in Chinese art circles. View Wang Guangyi paintings, biography, solo exhibitions, group exhibitions and resource of Wang Guangyi. View art online at The Saatchi Gallery - London contemporary art gallery.